Wholegrain oats. High fibre. 43 calories per biscuit. 4 pouches of 5 biscuits. Wheat free recipe. No GM ingredients. No hydrogenated fat. No artificial colours, flavours or preservatives. Suitable for vegans.40% less sugar* *than the average sweet biscuit Our product contains sustainable palm fruit oil. Naturally delicious Our tasty, wholesome oat biscuits are bursting with natural flavour. They contain no artificial colours, flavours or preservatives and are full of the goodness of wholegrain oats. They're high in fibre too. We've compared our oat biscuits to over 100 similar sweet biscuits, and the good news is they contain 40% less sugar* than the average of all those biscuits. 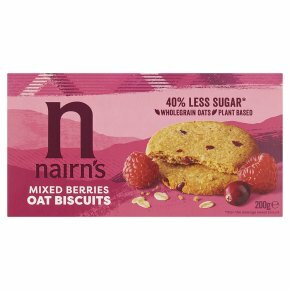 At just 43 calories per biscuit, Nairn's Mixed Berries Oats Biscuits are the perfect little treat to have with a cuppa. Packed in handy pouch packs, they are easy to pop in your bag for on the go. *see website for details.